The Nomad Factory contacted me recently and asked if I would like to test run one of their Travelers Notebooks. All thoughts in this post are my own. I wasn’t aware of The Nomad Factory before they contacted me asking if I would like the review one of their Travelers Notebooks. They’re based in the UK with the leather sourced from Yorkshire and the notebooks created in London. It’s nice to see a UK stationery company creating high quality and well considered products. 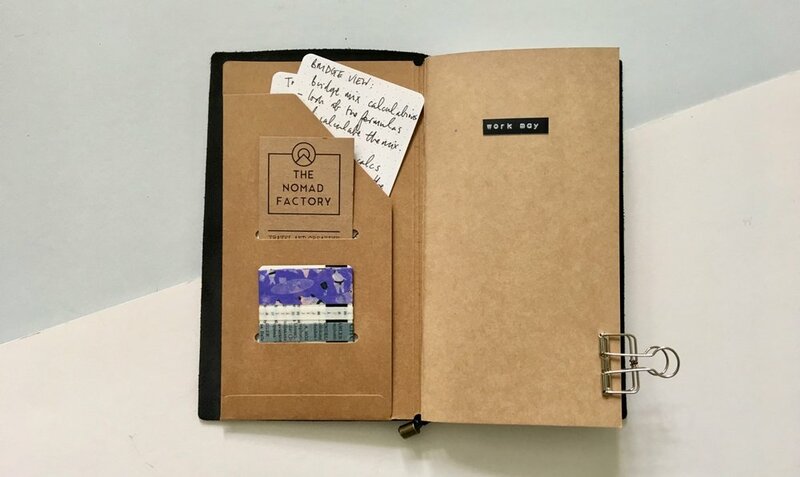 The Nomad Factory’s take on the Travelers Notebook. 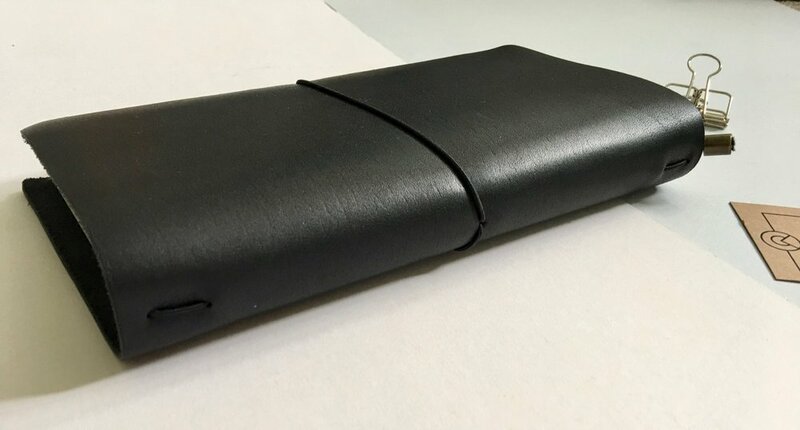 It’s obvious from the moment you open up your package that The Nomad Factory has thought about the presentation and delivery of their leather notebook covers. The product arrives in a kraft box that’s filled with torn kraft paper. The notebook itself is held in a cloth bag with The Nomad Factory’s branding on the front. This cloth cover is thick and sturdy, moreso than the Travelers Company equivalent. The notebook is similar to what you would recognise from the Travelers Company. It comes in the standard A5 slim size. There are three different leather colour options, black, brown and rustic (which looks like a worn brown colour). I have the black one which I have been using for a few weeks now. I’ve noticed as I’ve used my notebook that the leather doesn’t mark easily. Personally I don’t mind scratches and signs of wear and tear but this leather holds up well with use. Alongside this its also lovely and soft to the touch. The elastic with each of the notebooks matches the leather colour. It’s fixed from the spine rather than from the back flap and there are no knots but a clean clasp that means no lumps or bumps from your notebook. All of the elastic is secured by a metal clasp that hangs from the bottom of the notebook which almost feels like a bookmark. The Nomad Factory notebook comes with three inserts. There is a ruled, grid and plain insert each with 32 pages. This is less that you would normally expect, I think for this size the common number of pages is 64, but the quality of the paper is good. They handle most of my writing materials well. I have used fountain pens without any bleed through issues and no feathering that I noticed. The grid lines are a muted grey colour and not too bold and distracting. That’s a big win for me. I did a small pen test also throwing in a few ink and drawing pens to see how the paper held up. With the Noodlers Black ink in my brush pen the paper did buckle a little under the weight of the ink and the Copic marker bled through quite badly. Neither of these things are a surprise. All of the other writing tools I used worked really well on the paper. How I’ve been using my Nomad Factory notebook. I have been using this notebook as a catch all. I’ve used the ruled notebook for my morning pages, the grid notebook as my work notebook and I intended to use the plain for doodling but this didn’t really pan out. The cardboard insert holds a few Baron Fig Strategist notecards in there for any throw away notes and a washi tape card. For a small period of time I did throw in my Superior Labor pouch but this really stretched the leather far too much and made the notebook too bulky. I think three inserts is the maximum this is set-up to handle. The Nomad Factory also sent me through a small pouch filled with clips and bookmarks. 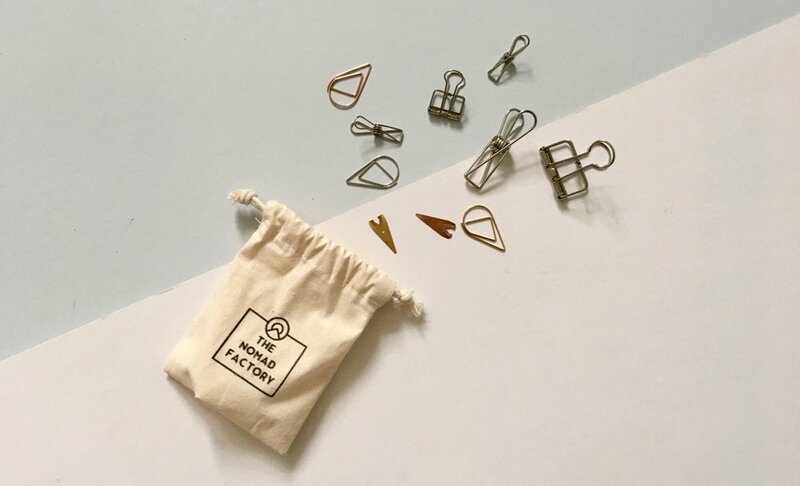 There were a range of different options and sizes such as book darts, arrow clips, skeleton clips and fish clips, both of which in small and large sizes. I love these style clips. They look good and come in copper, silver and gold and they are so handy. The small pouch is also really handy. 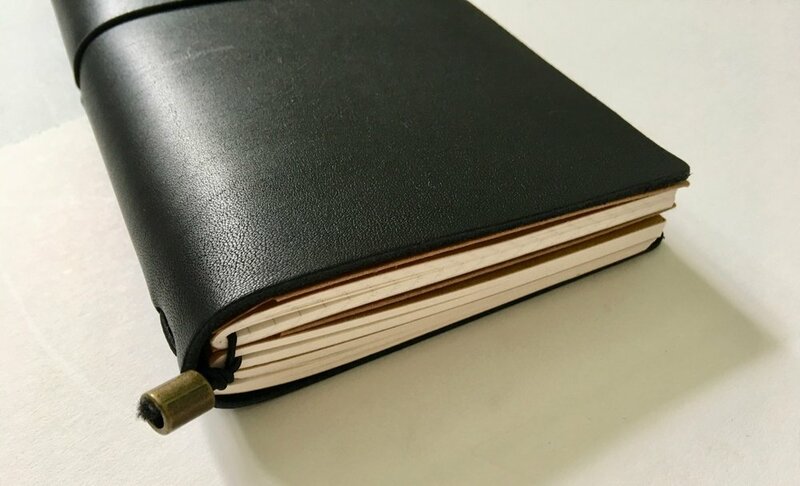 I really like The Nomad Factory’s take on the Travelers Notebook style leather notebook cover. The leather quality is really nice and it takes being used and thrown around well. The Nomad Factory also offer a few different variety bundles and starter packs which would make great additions or gifts. 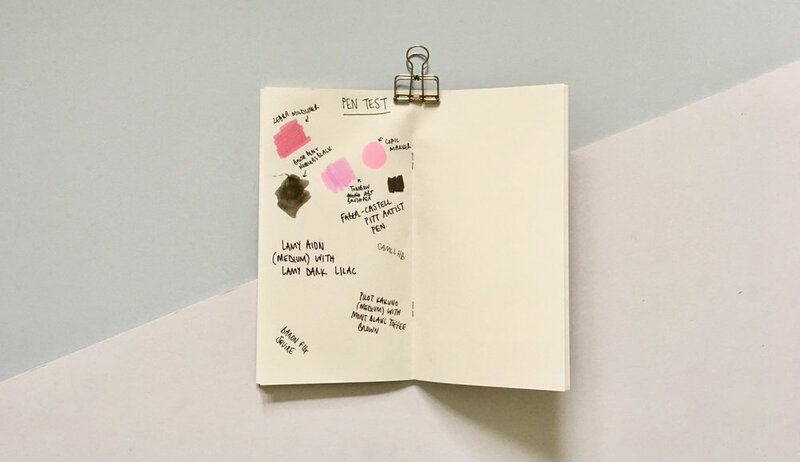 I think these notebooks are a great Travelers Notebook option and comparably priced with other products you can find online but they include the inserts to get you started. The leather is perhaps a little thin if you’re a heavy user, or someone who needs some sturdiness to their leather notebook cover. Thanks again to the Nomad Factory for sending me this notebook to review on the blog.